You Ride a Motorcycle? Isn’t that Dangerous? Sitting in the cafeteria at my office I can’t help overhear the conversation at another table. There are three people talking about motorcycles and I can tell by how the discussion is going none of them are riders. I want to go over and talk with them and share what I know about bikes from my 15 years of riding. I should go over there, but I don’t. There’s a better way to make my point than getting into a discussion about the relative safety of riding a motorcycle. We’ve all had conversations with non-riders that start out “You ride a motorcycle? Isn’t that dangerous?” There are a thousand ways to answer this question. I’ve read as many articles and books that have tried to explain it in one way or another. Of course non-riders don’t read articles in motorcycle magazines or motorcycle books where most of these discussions are printed. So, how do I educate people on what riding is and what it’s not? To me the answer is easy. In order to change people’s perceptions about motorcycles I must be an example of what I want people to think of when they see a motorcycle and rider. If I want non-riders to think bikes are safe, I need to ride safely. If I want them to see a bike as a practical means of transportation, then I need to use my bike for transportation. If I want people to think riders are safe, then I need to wear safety gear and show them what safe riding is. 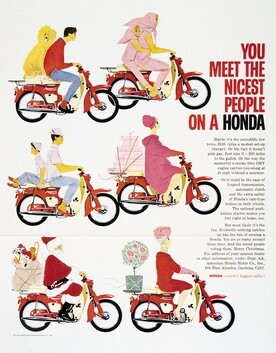 Honda had an ad campaign in the 50’s with the tag line “You meet the nicest people on a Honda.” They showed pictures of normal people riding and having fun on a motorcycle. It was a huge success and Honda’s sales soared. What images in advertising for motorcycles do we see these days? The most recognized brand in motorcycles today promotes a lifestyle that is an escape from reality. It is the antithesis of normal people. The ads promote an individuality achieved by joining and looking like a specific group. They are also more than happy to outfit you with both clothes and a bike. Just like Honda, selling a lifestyle is almost more important than selling the motorcycle. The other ads I’ve seen are more about financing and deals and less about the bike or a lifestyle associated with riding. Me: “It’s a blast … etc. As a rider who wants to have the respect of car drivers, the law, and even other riders I need to make a concerted effort to ride the way I want others to see riders. I am making a conscious effort to ride as if I was an ambassador for motorcycling. I want others to see me and think positively about riders and motorcycles.